Put your feet up and let the Intelligent Floor Vac do all the work. Cleaning has never been so easy! 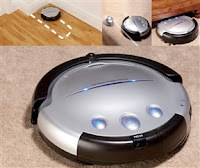 The intelligent floor vac can be used to clean a variety of different floor surfaces. The flat design allows it to clean under sofas and tables. Features a virtual wall up to 13ft wide to keep the cleaner in the room you want it to be in. The auto cleaner turns off automatically when its picked up by the grab handle.